mommy's reviews: Celebrate National Doughnut Day on 6/5! 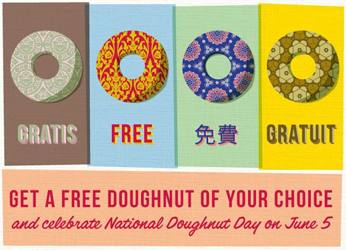 National Doughnut Day is coming up and there are several doughnut shops offering FREE Doughnuts on that day, which is June 5th. Here they are!! 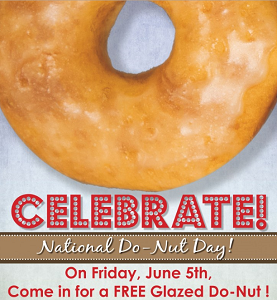 Get a FREE Glazed Do-Nut at Shipley Donuts on Friday June 5th from 5am to 12pm! On Friday, June 5, 2015, in honor of National Doughnut Day, guests will be treated to one FREE doughnut of any variety at participating Krispy Kreme® US and Canadian store locations. Offer valid for one FREE doughnut of any variety, including the signature Original Glazed® doughnut, at participating Krispy Kreme US and Canadian store locations on Friday, June 5, 2015 only. No purchase necessary. While supplies last. Offer not valid at convenience or grocery stores. Excludes Connecticut and Puerto Rico locations. Visit KrispyKreme.com to locate a store near you.